THE MOST TRANSPARENT and COST EFFECTIVE car rental booking engine to hire a car in KULATA. Budget car rentals are offered in every rent a car class in KULATA - economy car rental, sedan or estate car, family minivan, 12-17 passengers minibus, adventure 4WD, cargo van or a couch. Our KULATA car rental fleet is built of reasonably priced cars for rent available at low rates starting from 7 EUR a day on all-inclusive basis - full insurance, unlimited mileage, second driver free on a single contract, pre-paid road taxes and everything else you may need with your car rental. Being long in the car hire customer service we know what you expect from us, and how to treat you. CAR RENTAL REVIEWS FOR KULATA! We value our returning car rental customers and reward them with great online discounts. If you book over 3 car rentals with us, you are entitled to a discount rent a car coupon. Don't forget to check our BULGARIA CAR RENTAL TIPS and to ask for our latest AIRPORT TAXI HIRE deals in Kulata. Bulgaria′s main border checkpoint with Greece - Kulata is situated 13 km east of Petrich, 33 km east of Zlatarevo checkpoint at the border with Macedonia, 200 km south of Sofia and 280 km southwest of Plovdiv. Kulata is located on the first-class European route E79 that connects Sofia with Thessaloniki and will be a significant stop along the most expensive Bulgarian highway, the Struma highway between Sofia and Kulata that will further develop the major European transport corridor passing through the village, connecting West Europe with Greece. The railway from Sofia to Thessaloniki also passes through Kulata. If you are entering Bulgaria by land, crossing the border at Kulata and need to hire a car, Motoroads offer its customers not only the most exclusive deals but the most reliable car hire service in Kulata. 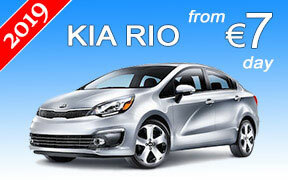 And if you pre-book your hire car in Kulata before heading to Bulgaria, you can save considerably. So no matter, if you just want to explore the southwest region of Bulgaria, full of historical and cultural landmarks or need a quality car hire service immediately after entering the country from Greece, we will be glad to organize your car hire in Kulata in a fast and secure manner. Simply, take advantage of our online car hire reservation system offering a user-friendly and feature-rich booking method to get exact Kulata car hire quotes and make instant online reservations with just a few clicks. KULATA CAR RENTAL » WHY MOTOROADS ? What you see is what you pay! We don't apply any hidden charges online or at our Kulata car rental desk. Your Kulata car rental booking is processed online instantly on a secure server. We require only a small amount to be paid in advance to secure the booking and the balance is due upon car collection in Kulata. We apply the most fair fuel policy FULL-FULL for all Kulata car rentals. You will get your rental car with full tank in Kulata and have to return it full. Some exceptions may apply for busy rental periods. Our Kulata car rental rates include full insurance - Third party liability coverage, CDW (Collision damage waiver), VTW (Vehicle Theft Waiver) and no excess. All Kulata car rentals have unlimited mileage. The second driver on your Kulata car rental contract is free of charge. We do not charge any additional fees for winterization (winter tires) online or at our Kulata car rental desk. All cars are equipped with proper seasonal tires. You can change your booking free of charge up to 24 hours prior to car collection in Kulata. It is subject to availability for the new car rental period.